It's my birthday! I'm 35 today. A new check box on forms, half way between 30 and 40, and the same age my mum was when she had me, which makes me half her age and which also means that when Freddie is my age I will be 70! Wow.... I much preferred birthdays in my 20s. So... Call it a treat for the kids since I have the misfortune of having my birthday in the Summer Holidays. Or maybe call it refusal to get older just because another year has passed. 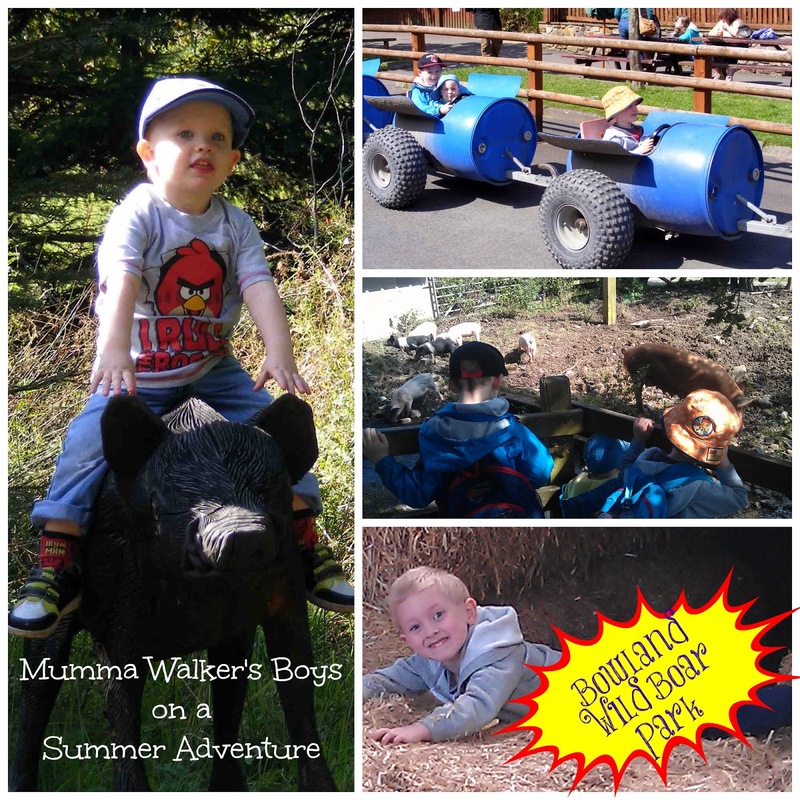 This year we went to Bowland Wild Boar Park with the kiddies, and because it's my birthday MY Daddy paid! Heehee! We've never been here before but the boys have been pestering to go all summer after they found some leaflets (which they call maps and read in the car) and it does look good. With it being my birthday and the kids wanting to bring Mummy breakfast in bed etc it was lunch time before we arrived. We went straight to the cafe and ordered Wild Boar Burgers, which were yummy! The kids first choice of activity was the barrel ride! A kids only ride around the park riding in barrels towed along by a tractor. Jack rode with Georgie on his knee and Tom had a barrel to himself. They get seat belts. They had a great time! I'm quite envious, I'd have liked a go myself! We had a look at some of the animals. There are peacocks, chickens and piglets roaming around free, and enclosures with meerkats, raccoons, red deer, not to mention the huge assortment of piggies and boars! The kids loved seeing a real life Mummy Pig along with her piglets. Then they discovered a big playbarn with hay bails for climbing over and in and we all piled in for a crazy half hour of running, climbing, hiding and chasing. We were lucky to be there when the chick Stroking session started and the kids were allowed to pet a chick, although only Jack took them up on it this time. We saw the meerkats being fed and listened to a talk about then, then we joined a guided tour of the boar and pigs which the kids really enjoyed, even 2yo Georgie got into it. They loved seeing the pigs race around following us - well following the lady with the bucket of food - and we're astounded at how big the adult pigs were. After the tour we had a look at a few more of the animals and feed some llamas (and cheeky ducks) before it really was time to be heading home. We hadn't seen all of it by a long way, and the kids have declared it to be one of the best things they've done all summer. So I guess we'll be coming back again one day soon!